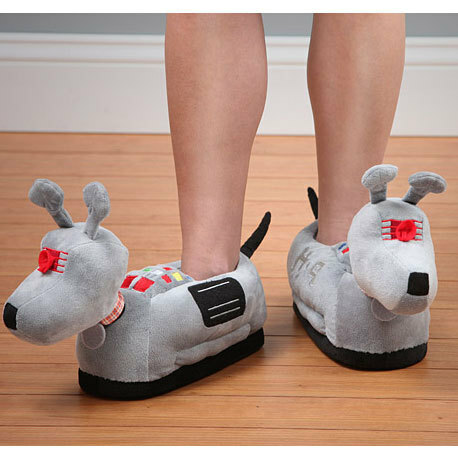 Doctor Who K-9 Slippers | Keep your feet warm and fuzzy with K-9! Keep your feet warm and fuzzy with K-9! With these unique embroidered slippers! 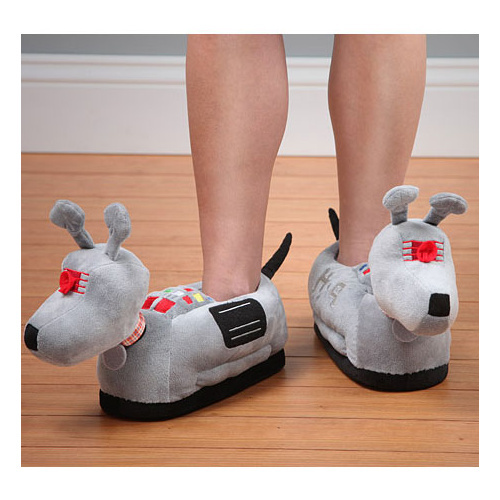 These officially licensed slippers, which honour the classic "Doctor Who" companion and robot dog K-9, are polyester embellished with embroidered details and K-9's signature collar and blank felt tag. With a non-slip bottom, these K-9 slippers will keep you on your toes and keep you warm as you kick back and relax into a Doctor Who movie marathon! K-9 is truly one of a kind, and whilst the Doctor may have only travelled with one K-9 at a time, why not own a K-9 pair? They'll be your ultimate companion around the home, with all the characteristics you look for in a canine friend! Both his ears and tail have been stuffed to stand to attention too, what an incredible gift for any Whovian in your family. Made from 100% polyester inside and out, keep away from fire. Available in S/M (ladies' size 5-7) and L/XL (ladies' size 8-10). These slippers look really cool and feel great on my feet, but they send my dog really wild with the K9 head bopping up and down.